The Aral Sea is actually not a sea at all. It is an immense lake, a body of fresh water, although that particular description of its contents might now be more a figure of speech than practical fact. In the last 30 years, more than 60 percent of the lake has disappeared. 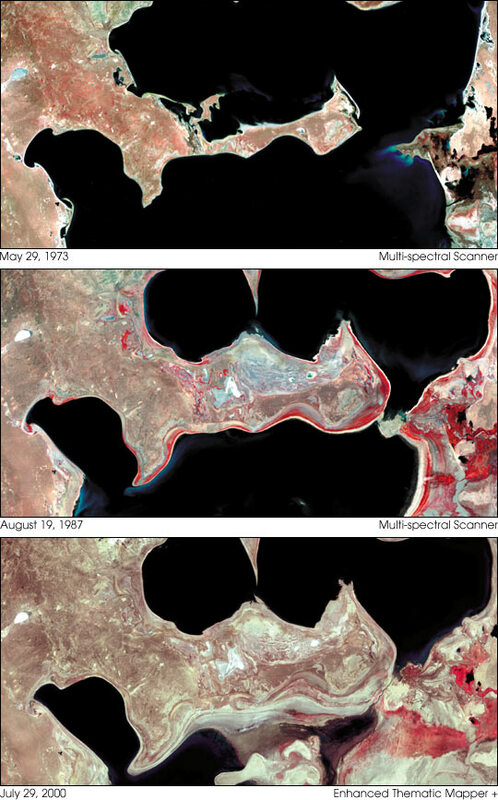 The sequence of images above, acquired by Landsat satellites, shows the dramatic changes to the Aral Sea between 1973 and 2000. Beginning in the 1960s, farmers and state offices in Uzbekistan, Kazakhstan, and Central Asian states opened significant diversions from the rivers that supply water to the lake, thus siphoning off millions of gallons to irrigate cotton fields and rice paddies. As recently as 1965, the Aral Sea received about 50 cubic kilometers of fresh water per year—a number that fell to zero by the early 1980s. 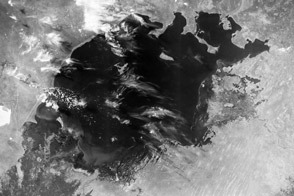 Consequently, concentrations of salts and minerals began to rise in the shrinking body of water. That change in chemistry has led to staggering alterations in the lake's ecology, causing precipitous drops in the Aral Sea’s fish population. The Aral Sea supported a thriving commercial fishing industry employing roughly 60,000 people in the early 1960s. By 1977, the fish harvest was reduced by 75 percent, and by the early 1980s the commercial fishing industry had been eliminated. The shrinking Aral Sea has also had a noticeable affect on the region's climate. The growing season there is now shorter, causing many farmers to switch from cotton to rice, which demands even more diverted water. A secondary effect of the reduction in the Aral Sea’s overall size is the rapid exposure of the lake bed. Strong winds that blow across this part of Asia routinely pick up and deposit tens of thousands of tons of now exposed soil every year. This process has not only contributed to significant reduction in breathable air quality for nearby residents, but has also appreciably affected crop yields due to those heavily salt-laden particles falling on arable land. Environmental experts agree that the current situation cannot be sustained. Yet, driven by poverty and their dependence upon exports, officials in the region have failed to take any preventive action and the Aral continues to shrink. For more details on the shrinking of the Aral Sea, please see the American University case study Aral Sea Loss and Cotton. Image courtesy USGS Eros Data Center, based on data provided by the Landsat science team.